"Yesterday she was chosen, at midnight she was sacrificed, this morning she was buried. And tonight she comes." 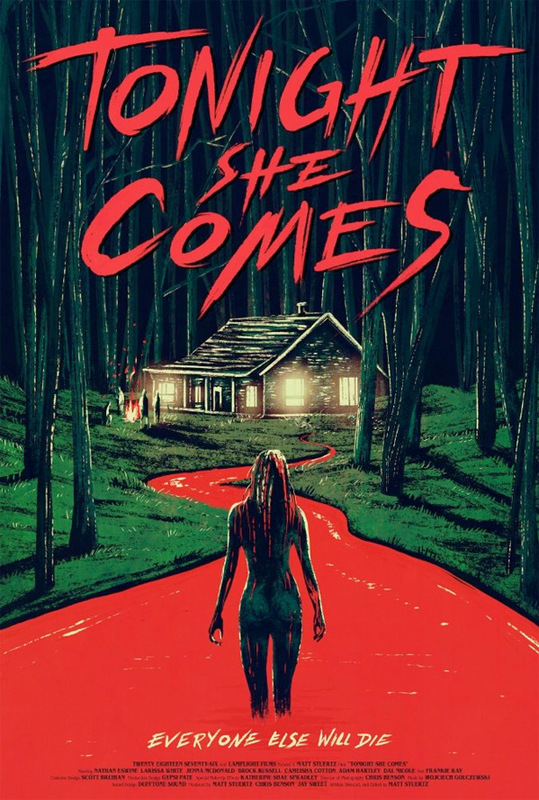 Studiocanal UK has debuted one final official trailer for Matt Stuertz's Tonight She Comes, a new horror film set in a cabin in the woods (but of course). This already premiered at film festivals in 2016, and opened this week in the US and is available on DVD in the UK, so if you're interested it shouldn't be hard to find. Tonight She Comes is about a group of friends who go to an isolated cabin after another woman goes missing nearby. As the sun sets, they drink, laugh and flirt. But as midnight approaches, little do they realize death is not far away. The cast includes Larissa White, Jenna McDonald, Dal Nicole, Frankie Ray, Adam Hartley, Cameisha Cotton, Brock Russell, and Nathan Eswine. For die-hard horror fans only. After a girl goes missing, two of her friends and a mysterious set of strangers find themselves drawn to the cabin in the woods where she disappeared. They will laugh, they will drink, they will kiss, they will make love, and THEY MUST ALL DIE. Tonight She Comes is both written and directed by young filmmaker Matt Stuertz, his second feature film after another horror titled RWD previously, as well as a few shorts and other horror work. This first premiered at Grimmfest in the UK last year, and also played at numerous other festivals, including this year's Sitges Film Festival. Tonight She Comes opens in select US theaters + on VOD starting October 5th, and is already available on DVD in the UK for anyone interested. Thoughts?